The European Digital Cinema Forum (EDCF) has just published ‘The EDCF Guide for Film Festivals in the Digital Age.’ The free guide, available to download on the EDCF website (PDF link) was created based on feedback from professionals responsible for running major international film festivals in the post-film age. Because while most of the technical wrinkles have been ironed out from regular digital cinema operations in cinemas and multiplexes, this is far from the case for film festivals. This is a beginner’s guide for people who are dealing with festivals in the evolutionary digital age. It is for operators, engineers, planners, managers, and everyone who has an interest in the long life of film festivals. Typically these guides are written by leading digital cinema practitioners and companies from across Europe [and Jim Whittlesey] who share their expertise, experience and insights. In the case of the Film Festivals Guide the guiding spirit has been Angelo D’Alessio, who has been active with the Venice Film Festival and other events that have faced problems relating to the new digital realities. With analogue film being a rarity at almost all film festivals showing new films – and even many showing restored and remastered archive films – the Guide is timely given the large number of problems film festival staff encounter with what can often at best be politely described as half-baked DCPs (digital cinema packages) and equipment often temporarily installed. The Guide is helpfully divided into sections that can be used even as stand-alone aids: ‘Understanding Key Terminology’, ‘Frequently Asked Questions’, ‘Words of Warning’ (including ‘Lessons Learned’) and ‘Quality Management System (QMS)’. No film festival is immune from the problems that often accompany digital. Not even the biggest ones like Sundance, Berlin or Cannes. Takes this example from last summer’s Cannes Film Festival. WWRD? : What Would Roger Do? That’s the question Chaz Ebert found herself scrambling to answer this Tuesday when a loud pop rang out two-thirds of the way through the only Cannes screening of Life Itself, the moving documentary about her late husband, venerated film critic Roger Ebert. With the loud pop came a flash of green. Then the screen went completely black. There was no one in the projection booth, and no Cannes Film Festival personnel in the theater to fix the problem. “I was horrified!” says Chaz. “Because I didn’t know what to do, and initially I thought, Oh, it’ll be over in five minutes. But that didn’t happen.” No one made any sort of announcement. The audience began to get restless; this is, after all, a film festival, and everyone’s scheduled meticulously. WWRD? Chaz wondered, panicking. Then she knew: “Roger would take control of the situation,” she says. It took thirty minutes to resolve the problem, with Chaz grabbing the microphone and inviting the film’s director to the stage. These sort of issues are just as, if not even more common at small and medium-size festivals. The problem is exacerbated by the fact that “most film makers do not have a lot of money or time” to get a film ready to meet the deadlines of a particular film festival. Anyone who has talked to technical staff involved in running a film festival will get a litany of horror stories. Some larger festivals like the London Film Festival, have even set up their own mastering operation housed in the BFI South Bank so that they can test, QC and if necessary try to fix broken or faulty DCPs. 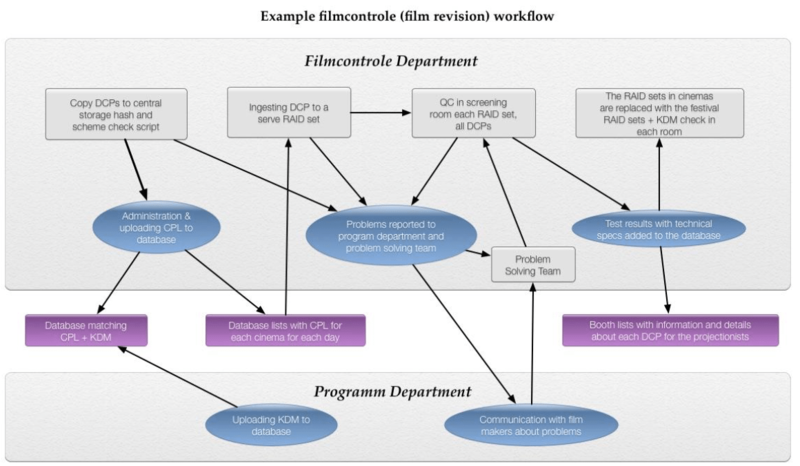 The issue of problems with digital cinema at film festivals has also been brought up at meetings of the ISDC. There it was pointed out that previously, film makers had to pay for a professional film lab to make a 35mm or 16mm print for a festival, which meant that all the sprocket holes aligned. Sure, colours might be off, but it is rare that a print would not play properly. A knowledgeable guy said that “the way we have to deal with DCPs in Film festivals has changed radically in the past few months/years. It is hard to setup recommendations when they are outdated one month later”. He thinks that the same things that are being set up in cinemas (full automation through IT-technology) have to happen at film festivals. “The next step is “Use IT-Technology” to run the film festival. If it comes to TKR, FLM and electronic delivery of DCPs and KDMs the whole game will change again. We should enable film festivals to be ready for the future”. However, there are many suggestions and practices that are timeless and practical in all circumstances. Above all the Guide reminds us that “At Festivals we can’t get quality of experience for nothing” it is worth paying heed to, because it is at Film Festivals that the next Nolans, Fellinis, Kieslowskis, Campions, Rays and Truffauts are likely to emerge. And it is free. Celluloid Junkie is a media partner of EDCF.